Join the discussion on our forums! Come discuss Cho'gall over in our dedicated Cho'gall discussion topic. 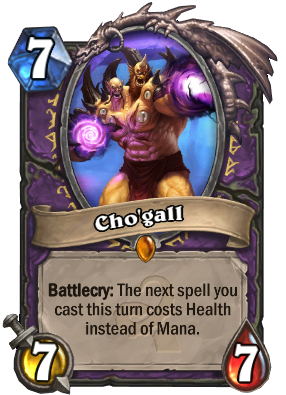 Cho'Gall is actually a good card, especially in Renolock, with the advent of spells like Amethyst Spellstone and his obvious combos with Siphon Soul, Shadowflame, 1 and 5 mana Kazakus Spells and Hellfire/Twisted Nether in a pinch. Emperor Thaurissian lessens the strain on his Battlecry, and building around a base of healing cards helps to lessen the pain of using him. It just comes down to when you need to play him and what you can get away with, but you don't have to deal with the hand holding of Krul the Unshackled. Cho'gall isn't a greed card, it's a matter of knowing when to use him - and he delivers when you do it right. I really dislike what Blizzard is doing with their legendaries. Bloodbloom has the exact same effect as Cho'gall and is generally better. Also, Terrorscale Stalker has the exact same effect has Princess Huhuran. I mean, I like new cards, but I hate how they have the exact same effects as previous legendaries. Making the previous legendaries, less "legendary." Princess huhuran is the prime example. It got outplayed by Bloodbloom, which exactly does that Cho'gall could do,and it's a a 2-mana spell. Has Cho'gall's time come? Maybe. I think with Blastcrystal Potion he's gotten stronger. In wild he's better obviously, since it has Imp-losion. Come Thursday, time to start experimenting with this bad boy. The time for Cho'gall decks has come. Substitute Cho'gall into the deck below and he works fine see the comment section of it for my input. Got this guy golden earlier today, hyped for Gadgetzan to start playing him with Kazakus! 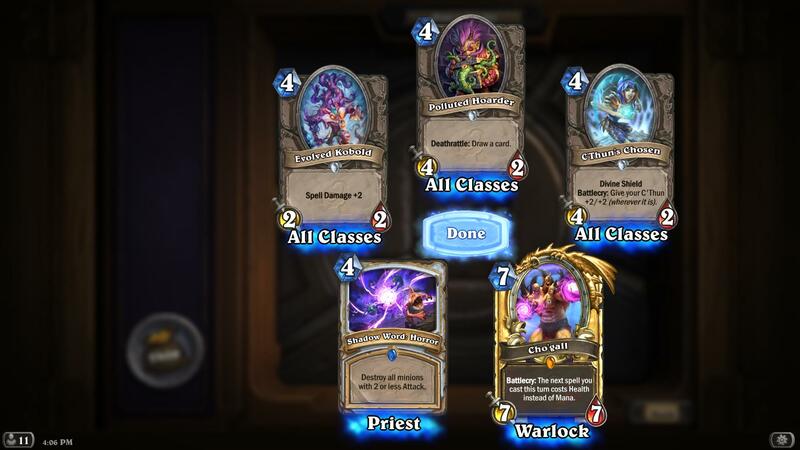 tl;dr Should I dustCho'gall for Bloodmage Thalnos? Bloodmage Thalnos is Amazing. I dont usually dust Legos but for this, I might. Next expansion Warlock gets a 3 mana 2/3 minion: "Battlecry: Whenever your hero takes damage this turn, it heals instead"
Blizzard please? I made it have bad statlines. Pretty please? I have a golden Cho'gall and will refuse to DE! but wouldn't make any sense. Not thematically, but it would be played and that is much better than what it is now. Warlock doesn't have that many good spells and therefore the value you can obtain from it is very low. Why couldn't the do "the next spell cast" or "all spells this turn" as it is it's a one shot thing that doens't do much.. if it was all spells cool moments could happen.. but Blizzard didn't want to give warlock a cool late game card.. Currently looking to dust this for other legendary card. Cho'gall might see play now with the Karazhan Violet Illusionist!